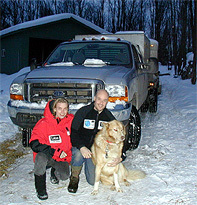 After years of planning, training, building sleds and web sites we are on the verge of heading North!!! We are leaving Grand Marais within few hours and will drive north towards Thunder Bay Ontario, Canada. We cross the Canadian border at Pigeon river, a very historic place from the old fur trade route days. Look up more at Grand Portage Natl Park. Our destination today is Winnipeg. Here we are invited to a native American ceremony for the dogs . From Winnipeg we will continue north to Gillam, a small little town at the end of the road. Then we unload everything in to a cargo train for the last way up to Churchill - our starting point. The distance from Thunder Bay to Churchill is approx. 1,500 miles. How many km is that? (note we only bring 30 days with us, the rest is flown ahead to resuply points) 18 boxes Endurance x 65 lbs =1170 lbs. 10 bags Science Diet x 40 lbs.=400 lbs. (we bring it all) 500 lbs. So, you can see we needed to eat our Wheaties this morning before we even left town. 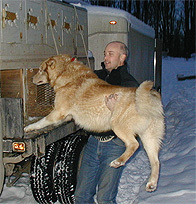 Now we also had to load all 20 dogs in addition to the gear and food. We are loading Choko into his dog box. Each dog has his or her own box to ride in. They might look small, however they are big enough for the dogs to turn around in and sit up. All boxes are filled with straw so its very comfortable, plus they know that when we get in these we are going someplace to go dog sledding. We normally travel between 6-8 hours before we stop. Then all the dogs get out to stretch drink and eat. As you can see we have a long ways to Travel .... On the road we go to Hudson Bay! !